Depending on one’s outlook, Mourning Doves are cherished, ridiculed as stupid, or are pests. The latter I fail to understand. Their stupidity…well I have evidence of….but I couldn’t begin to imagine Connecticut without them. Whether the soft dawn chorus, the whistling wings, or just their constant presence; there is never malice nor aggression in evidence, and if that meekness leads to ridicule? Well, that’s a deeper and darker thought than today needs. They are lovely birds, all the colors of a gentle dawn. Which is a long way of explaining why I was so glad that I checked the fish pond the other day. We have been having difficulties with the current arrangement (see Zombie Fish) and I had set the heater to run* and turned the pump off. What I didn’t consider was that turning off the pump meant turning off the waterfall. This meant that all the open water was now under the net around the bubblers. The net is fine, black mesh. The mourning dove flock had a habit of coming to the waterfall at dusk for their drink. I think you can guess where this is going. When I checked at dusk the other day, most of the flock left. All but one, one panicked dove caught beneath the netting. Maybe it was the brave one that figured out a way to get underneath. Maybe if I hadn’t come, it would have gotten out again. I don’t know. I do know that I moved very fast indeed to catch the panicked bird before it thrashed its way to damaged wings or a dunking in ice cold water. I think it had been caught for awhile since it rested in my hands for a solid five plus minutes before any indication that it wanted to leave. And when it did? One brief clasp of a claw around a finger, and then fast flashing wings up into the tree where the rest of the flock waited. 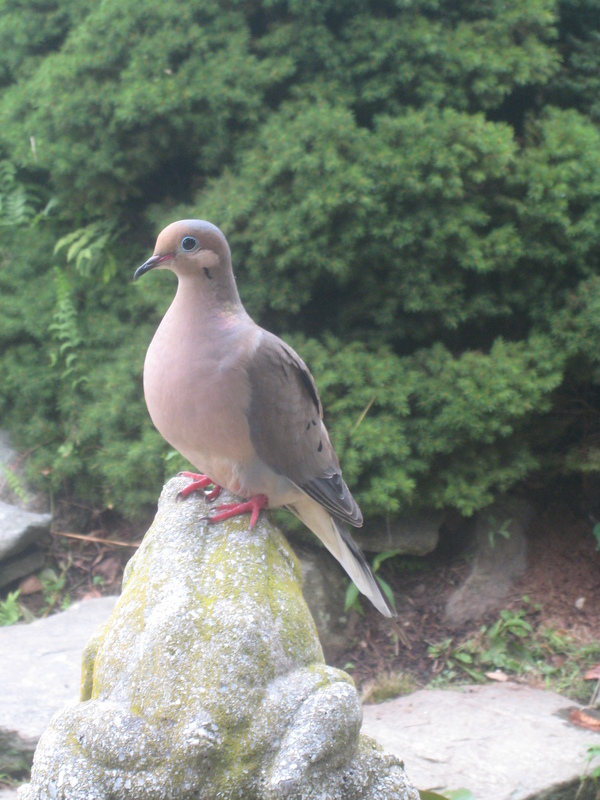 Photo of a Mourning Dove, at rest.